Upon arriving on site, we were invited to a barbecue by the Tasmanian Aboriginal Centre onto Gowen Brae, a camping area beside the beautiful and peaceful Nive River. With our bellies full and keen to get started on the survey, we set off searching that night for spiders along the rocks beside the river where we found some giant water spiders (genus Megadolomedes, family Pisauridae). This was great to see because an amateur arachnologist based in Launceston, John Douglas, who is in the process of compiling a book on Tasmanian spiders, tested my confidence about the species identification and we both agreed that it was a new species which will be named after John. This spider has long been known in Tasmania but was considered the same species as the one on the mainland, which is not the case. After that, we started looking around on the tracks, away from water. It was quite a cold night, even for Tasmanians, but the children we were with, were just wearing T-shirts and shorts (not me!). The very cold night seemed a good enough explanation (at least to a Queenslander) that the spiders would be fairly quiet–another silly assumption because the Tasmanian spiders spend most of the days in these cold temperatures and are well adapted to them. So, after a relatively spider-free night walk with the mob at Gowen Brae, we came across some rocks near the track. I looked under one and saw only a common invasive spider but one of the young spider enthusiasts, Robert Beeton, found a medium sized spider with long legs. When I saw the spider my hands started to shake, not from the cold or the fear of being bitten, but more the fear of losing or damaging what I recognised, after my initial disbelief, is a truly amazing spider. 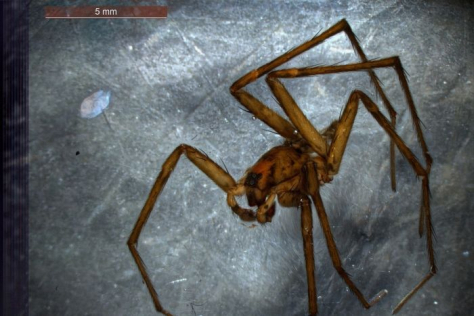 It is a member of the Racing stripe spider family, Miturgidae, which are widespread in Australia and there are at least three named species in Tasmania in two genera. On the mainland, Miturigidae have been one of several spider families that have been found killing and at least partially eating Cane Toads. That last Miturgidae spider that Robert Beeton found that night was something else altogether. It is a new genus that I have been working on and is very diverse in Australia’s dry country and deserts; it includes many new species that I have yet to name and all are from hot dry areas. The southernmost point I had other species of the genus was western Victoria, near the border. So I was dumbstruck to get the genus in these cold Central Highlands. Much work needs to be done to test my hypothesis but being in Tasmania suggests this should be one of the oldest species of the genus. Spider enthusiast Robert Beeton chats to local media about naming the newly discovered species paruwi, which is pakana for Beetle: Beetles was the nickname of his late father. So we got two great spiders that night, the giant water spider and the little one that got me really excited. Thanks to Robert Beeton, we hope to learn a lot more about its biology. As part of a launch of Bush Blitz II, the species name was assigned. It is definitely a new species and, in a ceremony in Melbourne in July at the Bush Blitz II launch, Robert Beeton provided the name which his family has chosen for the spider. Robert Beeton is a 13-year-old and a proud pakana from the North East Tribe of Tasmania. The species name of this spider will be paruwi which is pakana for Beetle: Beetles was the nickname of Robert Beeton’s late father.